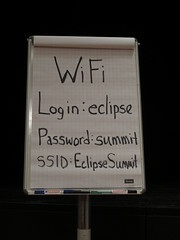 Another Eclipse Summit Europe is over and it is time to get back to the tasks that was postponed during the event. And it is time to reflect over what was good and bad in the event. If you participated, you should also consider doing the survey... this is the best way you can help improving the event. I really feel I have taken a lot of interesting information back home with me. There are quite few technologies and projects in the Eclipse world - both new and not so new - I will have to look into in the time to come. If I should point at one particular technology, I will have to look much further into, it will be XText. I have used XText professionally for the last year, but some of the things that was showcased at ESE, was well beyond anything I knew about. And I even teach about XText at the IT University in Copenhagen :-) The ability to use XText with Java types is one thing I will have to check out... especially the way the XText document was part of seaches! Another interesting technology is OCL, especially using OCL to specify live constraints in models. A well known performance problem most have experienced is the needed re-evaluation of the constraints when the data of the model changes. How do you limit the re-evaluation to just the constraints that needs to be evaluated? For a large model, the naive re-evaluation can take seconds or even minutes. I have just three wishes for the next Summit. First of all, I would wish the venue could be at a different location next time. I have nothing specific against Ludwigsburg, the Nestor Hotel or Forum am Schlosspark, but after four(?) years it is just time for a change of venue. Other than that, this was a perfect Summit, and many thanks to the organizers for all their work and impossible prioritizations.